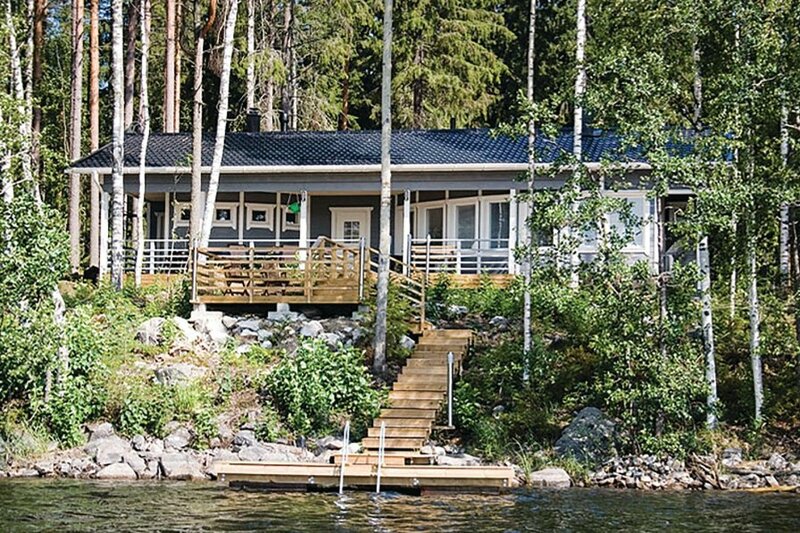 This stunning house is located on Lake Saimaa in Heinävesi, 50 km north of Savonlinna. The house has two bedrooms and a sauna room with additional sofa bed. The sauna is heated with wood. This stunning house is located on Lake Saimaa in Heinävesi, 50 km north of Savonlinna. The house has two bedrooms and a sauna room with additional sofa bed. The sauna is heated with wood, the stove is served by the sauna room, this serves as a fireplace. On the large terrace there is a gas barbecue, from here you come simply to the beach facing south. The private beach, a floating bridge and the rowing boat are free to use. With the help of a hired outboard motor, you can head to fish adventures on the lake. This beautiful modern cottage is made from wood and was recently built in 2011. The agent has rated it as a five star property so it is one of their best cottages - tastefully furnished and fully equipped. It is also great value for money. This cottage has beautiful panoramic view over water and is located in Lake District, 54km from Savonlinna. It is set in a very convenient location, just 20 metres away from a lake. There's also a restaurant 20km away.